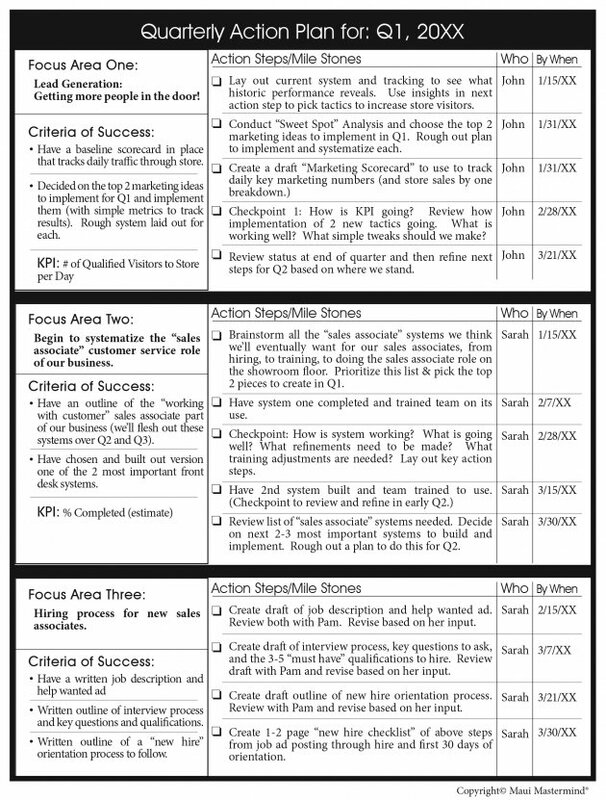 A powerful format and 3-step process to create your own 1-page quarterly strategic action plan to grow your company. As a leader of your company, you know it’s your job to keep your team and the company focused on the right things. In fact, to successfully scale, you must balance the need to focus on those fewer, better things that will make a leveraged difference for your company and your need to be flexible so you can adjust as you go. It’s as if you have a two-sided equation, with your need for flexibility on one side–markets change, opportunities appear, and tactics succeed or fail–and, on the other side, your need to gain momentum and for your staff to have the time to get meaningful blocks of work done. So what’s the key to maintaining a dynamic balance between flexibility and momentum? It is the quarter. The quarter is the perfect unit of time to bridge your big-picture goals–which probably have a two- to five-year timeline or longer–and your weekly planning and daily action. The quarter is the way to execute on your strategy to accomplish your business goals. It’s long enough that you can get meaningful units of work done that collectively bring you closer to your long-term goals, but short enough so that you can frequently course correct and hold your focus. 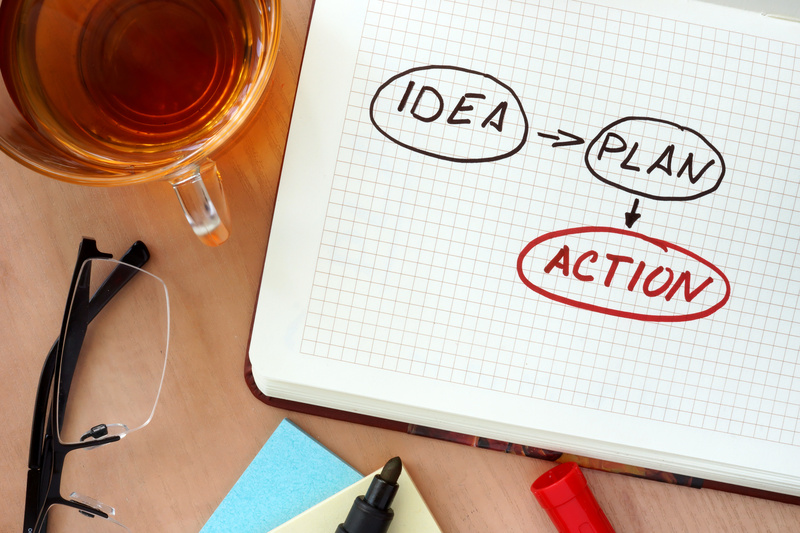 In a moment, I’ll share the format we use for our one-page plan of action, but first I want to share why I emphasize the need for a one-page plan. Why one page? We’ve learned from coaching hundreds of companies that in the rush of the day-to-day, you need to be able to take in your company action plan as a gestalt whole. If your plan is two or three pages (or, heaven forbid–14 pages! ), you just won’t use it weekly. We coach our business clients to review their company’s quarterly action plan each week. It becomes a clear accountability tool and GPS to ensure your team is focusing on the right things and hitting the key milestones on time. And with your plan being one page, you and your team can take it in with one look. This discipline of working with a quarterly one-page action plan has helped our business coaching clients enjoy an average annual growth rate of 32.4 percent. It just works. Your Focus Areas are the most important areas for your business to spotlight during the coming quarter. Sure, you’ll still have to take care of your company’s day-to-day operational needs. But in your Focus Areas that quarter, you will invest a portion of your best resources, because you know that these are the areas that will really help you scale and develop your business. I strongly advise you to limit your company to no more than three Focus Areas for the quarter (in many cases, having only one or two Focus Areas for the quarter may be a better choice). Why limit your company to three Focus Areas? Because too many top priorities means you have no top priorities. Ninety days go fast. If you spread your company too thin, you and your team will partially do things instead of fully doing a few key chunks that actually produce value for your company. So pick your Focus Areas carefully and invest your resources to get something special done on these fewer, better areas. Now that you’ve picked your three Focus Areas for the quarter, the temptation is to immediately go lay out your action steps for them. Don’t. Step two says to pause first and clarify your criteria of success for each. What would you need to accomplish this quarter to feel successful in this Focus Area? Generally, we suggest you pick criteria of success that you have control over (or, at the very least, you have a great deal of influence over). It’s important to look for criteria that are as objectively and quantitatively measurable as possible. When criteria are too subjective, you may reach the end of the quarter without agreeing on whether you succeeded. Also, we suggest that for every Focus Area you pick one “Key Performance Indicator” to track. If you look to this KPI to determine your performance, you’ll know if your company is on track to succeed in this Focus Area. Your written criteria of success for each Focus Area give you a yardstick against which to measure progress as you go. Also, by laying out your criteria of success for each Focus Area, you’ll have clear clues for what action steps you’ll need to take over the quarter–most of your action steps will be obvious. To keep your plan to one page, you’ll probably need to break down each Focus Area into five to seven action steps and milestones. While your plan must be detailed enough to guide your actions, it must not be so detailed that you feel overwhelmed or lose yourself in the minutia. With this structure, the owner doesn’t have to do all of the work herself–she just needs to be responsible for making sure that it gets done in the best way possible. If you would like to watch a 20-minute video training on how we do our strategic planning with clients to come up with their quarterly action plan, click here and access our free Scale Tool Kit. One of the 21 videos there is on exactly that–me walking a business owner through creating a one-page plan of action. Enjoy.